How to Build a Wooden Koi Pond. Here we discuss a more unusaul way of constructing a modern Koi pond in some detail, using as an example, a formal stock pond recently constructed for our own business, but made using a wooden frame. The pond featured below is an above ground pond utilising modern gravity filtration, and is heated. It features simple design and construction methods and was required as a show pond for high grade Koi but was also designed to show as much plumbing as possible, so that we could answer as many of the inevitable questions relating to the peculiarities of a modern Koi pond, its construction techniques and maintenance issues. Why a wooden pond? Firstly we were obviously trying to save money - but without reducing the overall quality and suitability of the finished product for purpose. 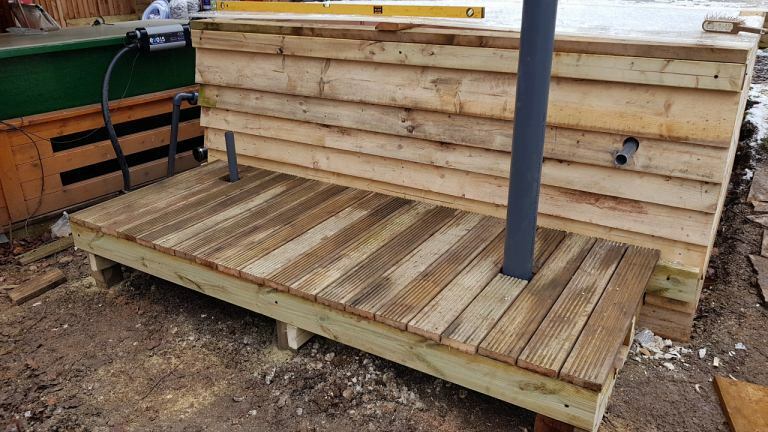 However, building this way can also save time and disruption - little or no concrete - no heavy equipment required - reduced peripheral damage to gardens and lawn - much more suitable for a DIY project - no builders required! Everything can be completed by an enthusiastic DIY er with no special tools. Also therefore potentially much quicker to build. In our case from start to finish, including fitting of filter systems , plumbing and heating 3 weeks - and not every day either. Before we dig the first spadeful of earth, it is vital with any Koi pond to have a design formulated and written down and on which the construction will be based. Clearly, with so many design possibilities, and with limited experience of Koi pond construction, it can be very difficult to choose the ideal design both in terms of what is really desirable and what will really work well. There is no doubt that the acquisition of a good book on the subject and/or studying the many web sites covering Koi husbandry will help enormously not only with the type of design to be chosen but also with the actual construction techniques employed. Hopefully this web page will help further before you begin your pond building project. 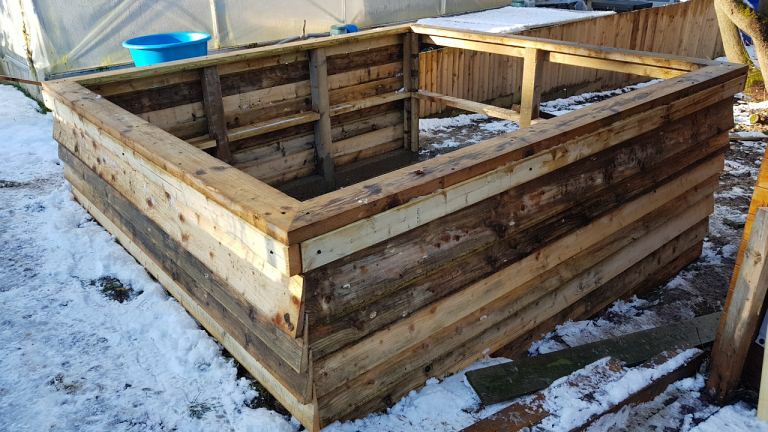 In our case, the important criteria was to best utilise a small area of available space previously used to house 2 x 300 gallon stock ponds for baby Koi adjacent to our main stock ponds. The objectives were:- 1. to construct a show pond which would show off Koi to their best in both one year old and two year old sizes. 2. Be easy and quick to build and very easy to maintain. 3. Incorporate oversized filtration because of the stocking densities envisaged. 4. Incorporate heating for temperature control and 5. Incorporate an Ozone system for ultimate water quality. The final design resulted in a pond approximately 2.7m long x 2.4m wide and 1.2m deep which would stand between 2 and 4 ft out of ground as it was to be built on sloping ground and which we calculated to be around 2000 gallons complete with the chosen filter system. The ground on which this pond was constructed slopes at an angle of around 10 degrees, so the are first had to be levelled. First we dug out the area to be occupied by the new pond to a depth of around 6" below top soil level, until we hit the chalky sub-soil. No other ground preparation wss carried out at this stage. We then marked out the rectangular pond site accurately using a marker paint (available in spray cans) and a builders string line in order to ensure that we could position the pond framing accurately. 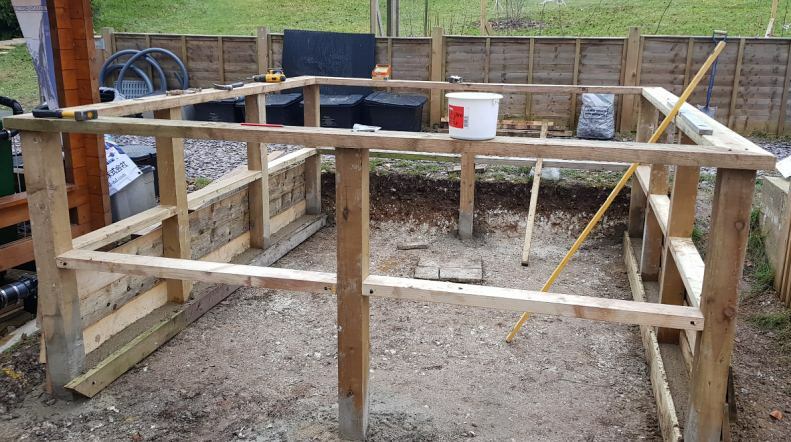 The frame was to be constructed from 4 x 4 inch tanalised posts. So holes were dug for the posts for the corner positions of one side first to a depth of around 15 inches using a post hole spade, which has a very narrow blade and is made for the job to ensure that the holes dont end up being unnecessarily large. With the four corner posts now accurately postioned and concreted into the ground, we again used our string line to mark the positions of the intermediary 4 x 4 inch posts which were to be positioned along the four walls - we decided to use one post for every 1 - 1.5 meter spacing to provide the necessary additional support for the side walls of the structure. So in this case we used a total of 10 posts to make up the main frame. Next we measured 1.2 m from the soil level up one corner post and marked this position, and then using a laser level, we marked the same position on every post. Then we trimmed off any excess post material to ensure that the top of all posts would be dead level. 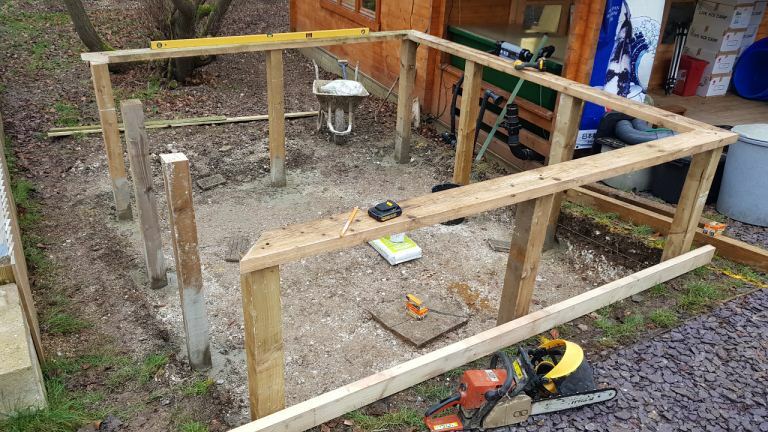 We then cut 6 x 2 inch joists to form the top frame of the pond walls and bolted them to every post using self tapping bolts so that there was a two inch overhang external to each post position. An intermediate frame was then formed from 4 x 2 inch timber approx two feet down from the top beams to add strength to the frame and to serve as formers to which the internal cladding would be screwed. To complete the framing, we then shuttered the areas between the base of each post to a depth of six inches and poured concrete into these areas so that a concrete ring beam would effecively be built at the base of the pond, between the posts to add the necessary strength here. This was our preferred method of reinforcement for the base, but of course one could easily use more 4 x 4 inch timber to give the same result. This is the point where most pressure would be exerted by the weight of water in the pond once filled so whatever method is chosen as a reinforcement, it needs to be reasonably substantial. 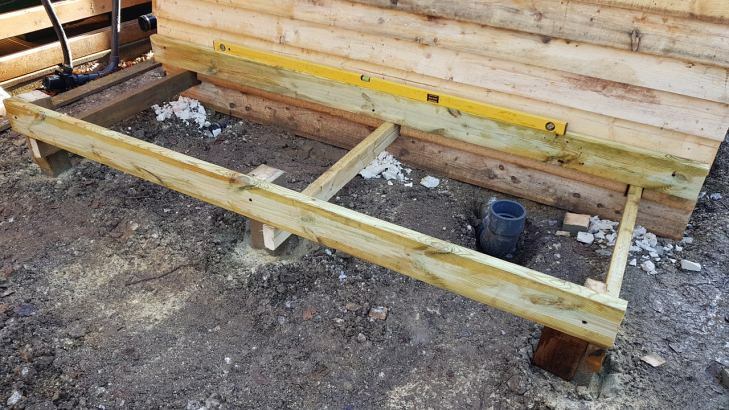 To provide support in each corner for the internal cladding which was to be used for the pond, we than added 2 x 2 inch vertical supports screwed to each side of each corner post. 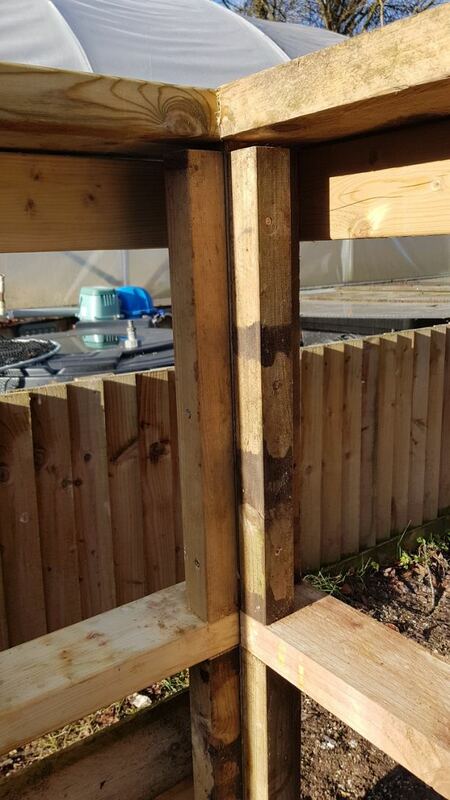 Next we began to clad the outside of the pond frame work using 8 inch feather edged timber nailed to the frame posts. Choice of material here is wide, we used the feather edge as it was the cheapest and readily available! Time for the plumbing! So we dug a shallow trench from the centre of the pond floor, through to around 30cm outside of the extrnal pond back wall. Then a slightly larger hole was dug dead centre of the pond floor where the bottom drain was to be positioned. 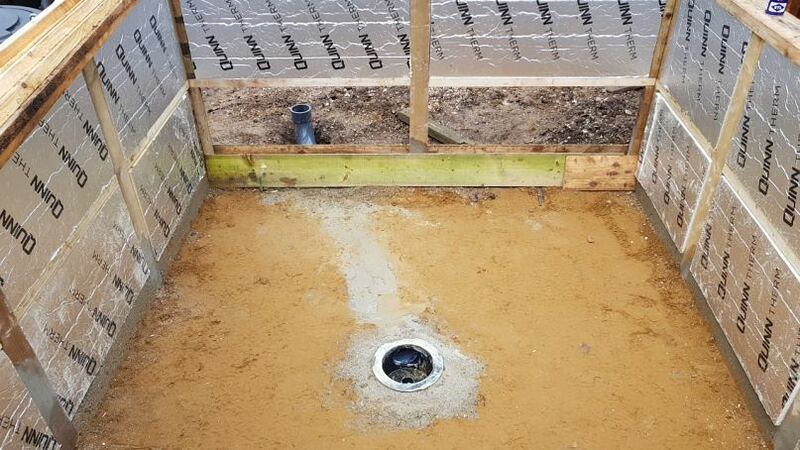 The bottom drain itself was cemented to a length of 4 inch pressure pipe and then concreted into the pond floor taking care to ensure that the lip of the drain protruded just above the pond floor at this stage. Post mix quick set concrete was then used to support the 4 inch pipe in the trench and the whole floor area was then covereed with soft sand to get a good level base. 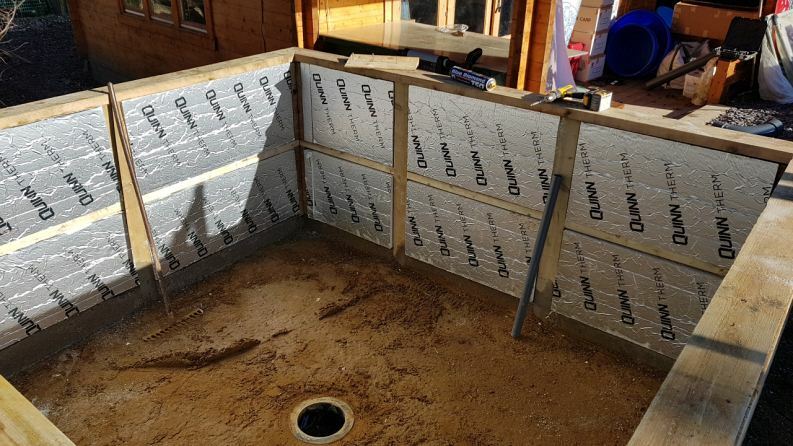 Next, we cut and fitted 4 inch thick cellotex type insulation into the frame work all round to provide a good level of thermal insulation to the finished pond. The filter area shown left all ready for the filter system to be connected - note the 4 inch filter feed pipe now connected along with the two 1.5" pond returns. The return on the right side of the picture is connected to a flanged tank connector screwed to the marine ply inner lining. Ditto the return pipe to the left of the picture, which runs under the base of the pond and up to the far opposite corner where it is similarly connected to a flanged tank connector screwed to the ply lining. 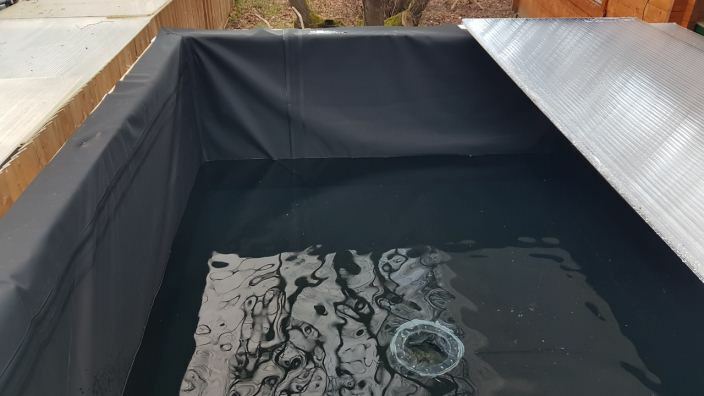 Having completed the internal lining of the pond using marine ply, we now finally levelled the soft sand base of the pond and placed a special waterproof insulated sheeting down. 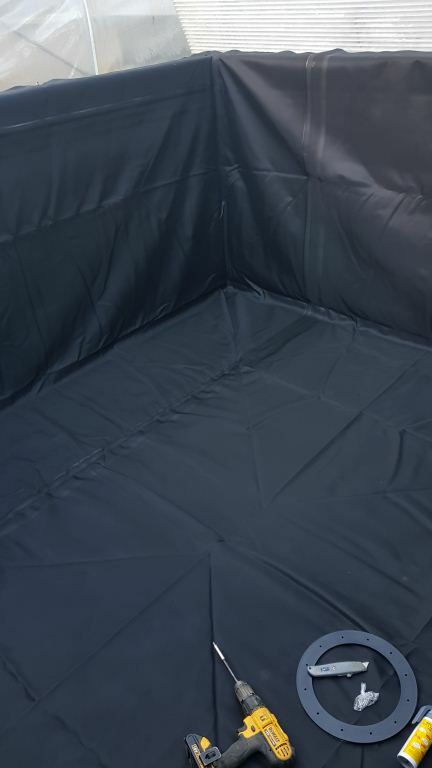 This is effectively a very dense polystyrene material , around 20cm thick, sandwiched between two layers of a waterproof membrane, which is commonly used under screeded wet room floors. This is easily cut with a stanley knife or similar and will provide good additional insulation to the pond. 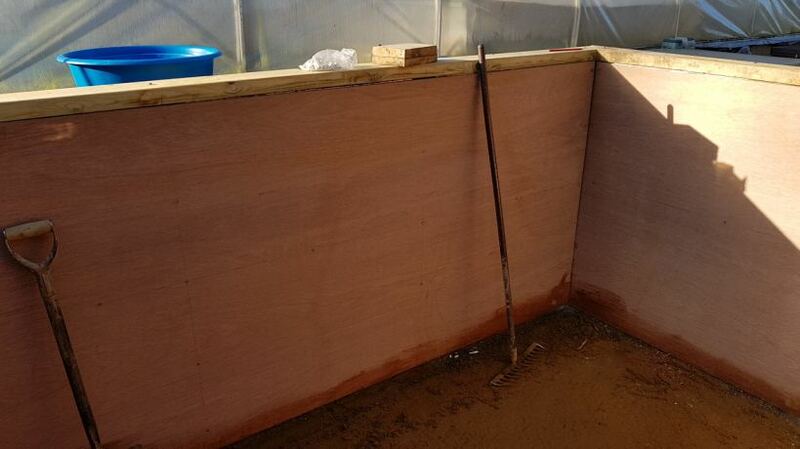 We were then ready for the pond liner and underlay to be fitted. First we laid down a polyester underlay material, to cover the entire inner area of the pond. This was simply stapled round the top edge of the pond to prevent it moving whilst the liner itself was installed. 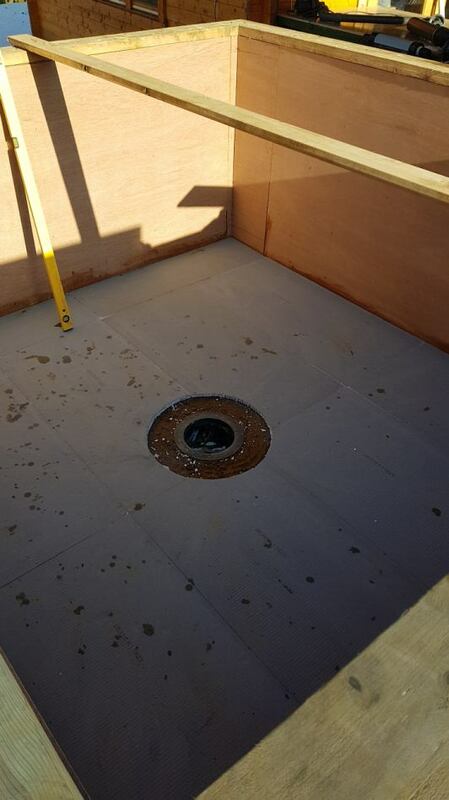 Suitable holes were cut out to facilitate the fitting of the bottom drain and pond returns. We had decided to use an EDPM greenseal 1mm box welded liner rather than flat sheet liner to make a much neater job with no folds. This ws relatively easy to fit, but was very heavy to move - so two people are advised to make handling easier. The liner was carefully positioned ensuring that each of the corners and seams were pushed tightly into position. The top flanged edge was then stapled to hold the liner in place whilst final adjustments to the position were made. We then cut out the hole for the bottom drain by simply cutting a relatively small cross cut in the centre of the drain position. Then lifting the cut flaps, these were gradually extended so that we could comfortably reach all around the inner and top face of the bottom drain. Gold lable mastic was then applied to the bottom drain flange, and to the bottom face of the liner flange to be screwed down. We used a bradle to find and line up one of the screw holes for the drain flanges then position and loosely fix one screw. Then swivel the top flange round to line up one hole on the opposite side of the flange. Once there are two screws in position the rest are easy to fit. With all of the screws in place we evenly tightened all of them to squeeze out excess gold lable and to form a good seal. the liner material remaining inside the bottom drain cavity was now cleanly cut off to leave a neat hole. We were then ready for the big fill. Once we had around 2 inches of water in the pond it was time to don the wellies and climb in. This is simply to try to remove any creases on the botttom face of the pond and to ensure best fit. 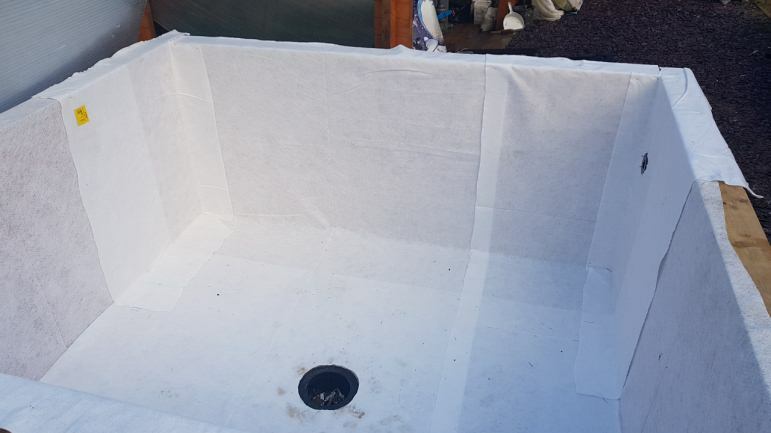 Note that we dont attempt to cut the liner for the pond returns until the water level is just underneath them to ensure we cut the holes in the correct place! The liner will move as the pond is being filled. 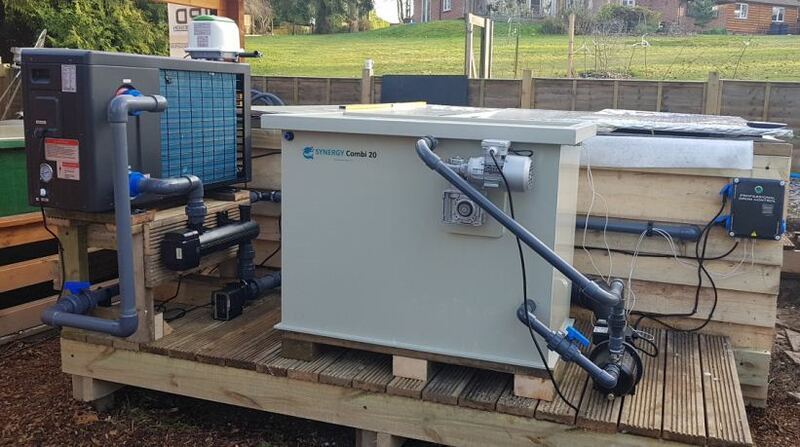 We had decided to use a Synergy 20/25 combination filter for this new pond, so now this was positioned and plumbed in. As the pond was also to be heated, we have installed a Hydro Pro inverter heat pump which has a COP of up to 13 and are among the most efficient heat pumps on the market today.So in the picture to the right note the filter controller module on the far right,and the drum filter high pressure wash pump to the right of the main filter.To the left of the filter is an Oase Aquamax premium 10,000 lph pump, coupled to an Oase Vitronic 36watt UV - installed immediately before the heat pump.Air supply to pond and filter is supplied by a Secoh JDK 80 lpm air pump.